In Command Prompt, I navigated to the T2 install for testing and typed Makmdb [motiondb.bin]. I also tried Makmdb [motiondb]. In either case, the motiondb.bin did not update, and no Nmotiondb.bin file was created. Do I understand you correctly - you're running makmdb.exe from the Thief folder? You shouldn't - from your screenshot, you should run it from your (...)/Motion Workshop folder, wherever it is. I'm trying to see if I need to change the .MC file somehow in order to change the motion. It appears that these files are required (.MI) and referenced (.MC), but I wanted to see if I could test an update of the database. If you're modifying the flags only, then modifying .MI file should be enough. Its corresponding, undmodified .MC file still needs to be present in motions folder when you run makmdb.exe, of course. MC file contains motion channels, MI is the meta-information of the motion, btw. Ok, I misunderstood. Thanks for clarifying. I thought the motions and MSchema folders were to go in the Thief folder, and makmdb was to be placed in them but not placed or run in the main T2 folder. Thanks, after marking left or right of a frame I've been setting flags as "start motion here" or "end motion here". What got me thinking about .MC was the fact that the motion clip would only play once at most in Game Mode and the .MI file was updated but the .MC file was not. The BlendUtils lgtoolkit files for Blender have python scripts for motion conversion, but I haven't figured them out yet. I had it in mind to clip motion frames in Blender. Last edited by Derspegn; 28th Jan 2019 at 07:04. One thing that you might have already considered is that the first frame and last frame of the motion should arrive physically at the same place, and the motion should include the AI moving to one position and back to the original position. Its been a while since I used the motion editor, and on today's resolutions it almost requires a microscope to see the stick figure's limbs. To me its hard to see the limbs rotate. Anyway all of the motion values should be the same in the first and last frame to make the motion seemless. You could probably get away with the last frame being the same as the second frame since in a loop the first frame will appear again after the last frame. I tried the second method with many settings under Play Options. The two frames are close enough for the AI to stay in roughly the same location. However, when I used both time-based and frame-based playback, using lower numbers for Time Warp, the AI would continually shrink in size while remaining in the same place. The AI is more stationary if Stretch is set to a very low value. I tried this with both the marker and lute object having DetailAttachment links. I did not get around to trying it with the Mesh Attach. 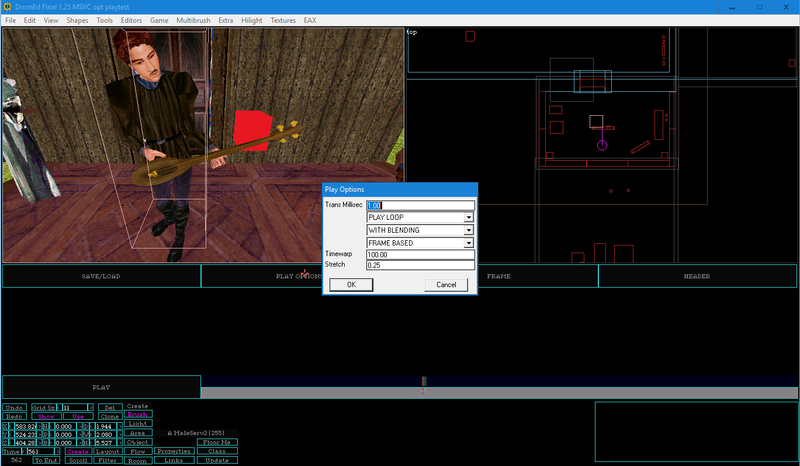 ***I DO NOT recommend using values such as 1000 or 0, especially for Play Options--Trans Millisec or Time Warp, as the Motion Editor crashed. 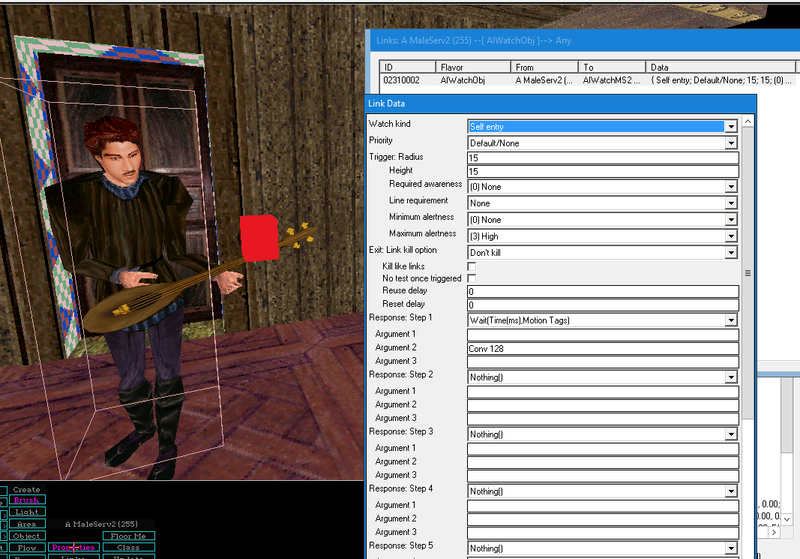 The Motions and MSchema folders should be in your Thief2 folder. IIRC you said this was a test installation so anything you do won't affect your main play installation. I run makmdb.exe from my Thief2 folder with no problems. Before I do so I make a backup copy of my current good working motiondb.bin file first. I do have the same motions and MSchema folders along with makmdb.exe and some other utilities in Tools\Motion Workshop as well. It seems like you are trying to place the start and end flags in a motion so that only part of the motion plays over and over? Even though the AI isn't locomoting it might still be moving over with just the limited portion of the motion... being incomplete the AI doesn't arrive back at the stating point. If this is the case maybe make a new motion that uses just the part you need along with a mirror image of the same motion. If your motion just for example is 345 then make it 345543 or 3454 so that it the AI returns back to the starting position without being pushed over. How are you making the AI play the motion? Just curious if you are using an ActorTagList parameter or is this in a conversation. 1. Yes, I'm trying to loop only part of the motion and have it repeat. I'm not sure I understand fully about the motion numbers. Were you referring to individual frame numbers or number values in the schema file? How would I make a mirror image of the same motion? With only the two frames the AI is shrinking instead of sidestepping. So it may be the case that the motion can't return to the original point and as a result has to shrink the AI to return to the starting point? 2. I'm mainly using an ActorTagList parameter with an ~AIWatchObj link to the AI. In some .cow saves I do have a malsev02~AIConversation--marker--~ControlDevice--button, which I remove when testing the AIWatchObj. I was able to generate a new motiondb.bin. I reloaded schemas, optimized, and saved a new .cow. However, DromEd is currently crashing in Game Mode when have the AIWatchObj link to the AI. There are 2 other different AI with ~AIWatchObj links, but their motions don't need to be modified. I need to test further to see if DromEd is crashing due to the 2 frame limit. It might be helpful for me to put up a video and show how the AI actually moves in MotEdit. If you want to go through this as a learning experience, that's fine. 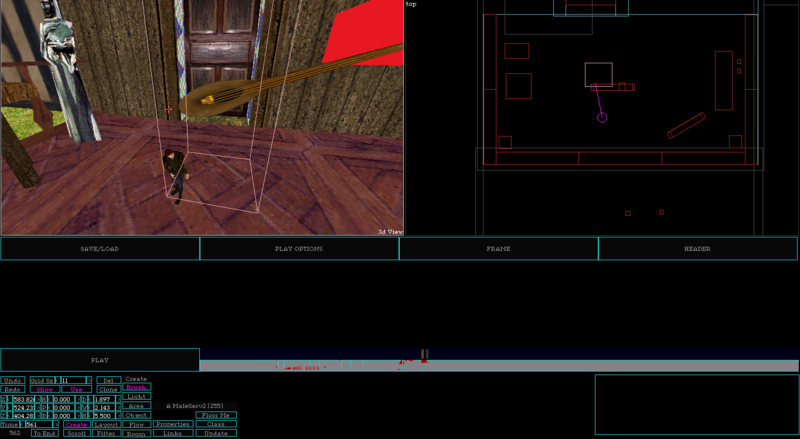 But if you just want to have this done, I can trim the motion as needed and send you new .mi and .mc files. No need to mess around with flags, in case flags are the culprit. Last edited by PinkDot; 29th Jan 2019 at 11:59. I can trim the motion as needed and send you new .mi and .mc files. No need to mess around with flags, in case flags are the culprit. Please, by all means, trim the motion (I was just about to ask for this). I usually start the motion at about frame 89 (1/3 or so into the motion). In MotEdit I've noticed that if the AI tends to rotate more to the right the further you go into the motion (last 1/3 section). That would be much appreciated! About 2 years ago I was having problems getting a sitting AI attached to an AIWatchObj link to play a motion. I started editing in T2 v1.18 and later updated to NewDark. 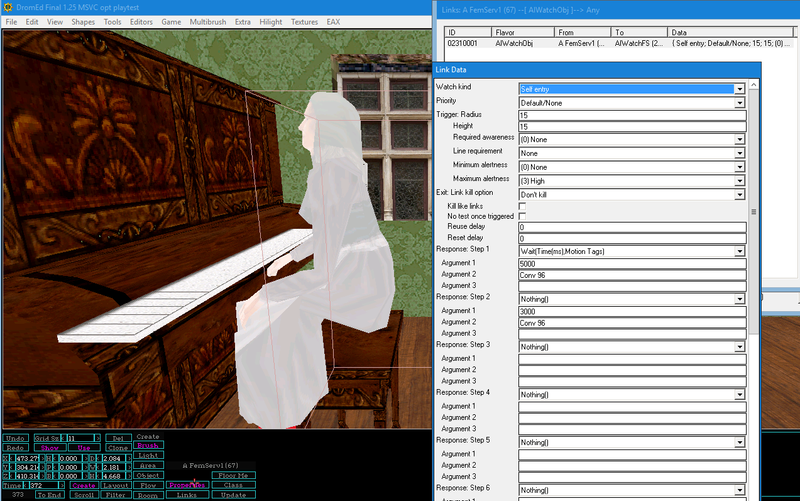 I found that this AI would not play the motion if the motiondb.bin was from 2015 (reload_schemas utilized, FM optimized), later than the 2004 version that (I think) came with v1.18. EDIT: The 2004 motiondb.bin was likely used when I started using v1.21. Yesterday when I first updated my own motiondb.bin, I had the same problem. I reverted to the old (2004) motiondb.bin, reload_schemas, then typed in show_phys_models twice (X2), and motion (Conv 96) would play again. I typed show_phys models twice with the newer motiondb.bin, but nothing happened for the sitting AI. I looked through my files trying to find if something was missing, thinking a new motiondb.bin would not support Conv 96. I guess everyone can choose where to put them but I like to keep all of my mission and resource building and testing together. I have more folders outside of Thief than in. I don't know much about motions so can't speak to most of what you posted, but a few things you said confuse me. You speak of upgrading from v1.24 to NewDark, but NewDark is everything beginning with v1.19. The reload_schemas command only reloads sound schemas, and has nothing to do with motion schemas. Those are compiled into the motion_db.bin file when you build it (from a DOS command line outside of Dromed, not using reload_schemas). I don't think any updated motion databases have ever been included with NewDark. If you had a later one from 2015 which didn't work the same as the 2004 version, you must have gotten it somewhere else, which means it is entirely possible that whoever compiled it left out some motions that are in the 2004 version (which I would assume is Shadowspawn's original extended motion DB). My bad, that should be v1.18. I messaged PinkDot, and the 2004 motiondb is likely Shadowspawn's extended motion database. I probably used that file after upgrading from v1.18 to v1.21.